Is bedwetting in primary school aged children common? Is this a normal stage of development or something more serious? Whilst bedwetting in pre-school children is very common, most (but not all) grow out of it by the time they start primary school. Many primary school aged children are still wetting the bed, which can cause anxiety for both children and parents. Rest assured if your school age child is wetting the bed – they are not the only ones in their class doing so! Although not common, some children may still be wetting the bed at high school age. So just how common is bedwetting in school children? The Royal Children’s Hospital reports that in Victoria, one third of four year old children wet the bed. Ten per cent of six year olds wet the bed as do about five per cent of ten year olds. 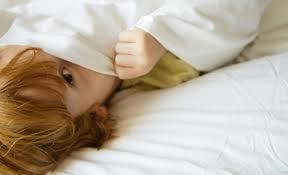 Bedwetting happens because children simply don’t wake up when their bladders are full. It isn’t a sign of laziness or a deliberate attention seeking ploy. Some bedwetters sleep heavily and their young bodies have not yet learned to wake up when their bladder is full. Bed wetting can run in the family as some people simply have weaker or smaller bladders. Others have kidneys that continue producing urine at night, causing the bladder to fill (most people’s kidneys slow down urine production at night). Stressful situations, such as family changes or starting school can trigger an increase or recurrence of bedwetting. This kind of bedwetting tends to ease with time as the child adjusts. If a child is suffering from stress or sadness it’s important not to create any unnecessary worry about bedwetting. What should I do if I am worried about my child’s bedwetting? Naturally, if you have any concerns about your child’s bedwetting is it important to speak to a doctor for medical advice. You will also make your life a lot easier by protecting the mattress with a full mattress protector as well as the Up and Under Linen & Mattress Protector for a quick and easy clean up for when your child does have a bed wetting accident. Simply pull back the covers, remove the wet Up & Under and replace with a clean one. Pull the covers back over the bed and you’re done! The time you’ve saved stripping the entire bed and washing loads of washing means you will get out the door on time.